Can you believe Valentine's Day is just around the corner? Maybe I should say Gal-entine's Day for this project? I love the notion of gifting girlfriends like we did in elementary school! 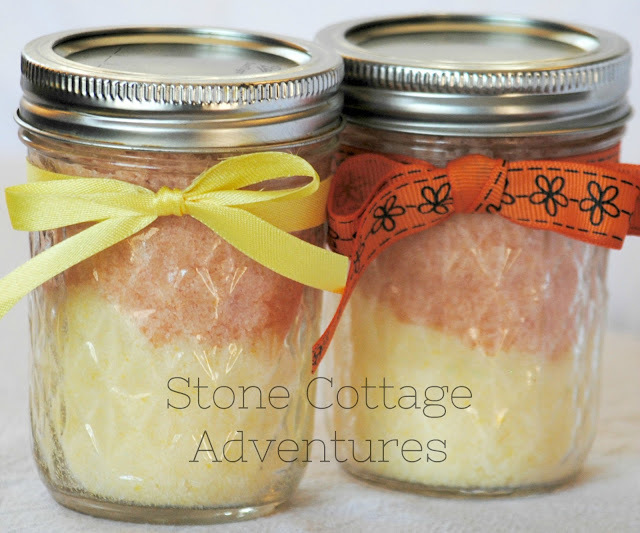 Last year, these Simple Bath Salts were a big hit! This time of year, the brutal, cold air of winter dries my skin horribly. 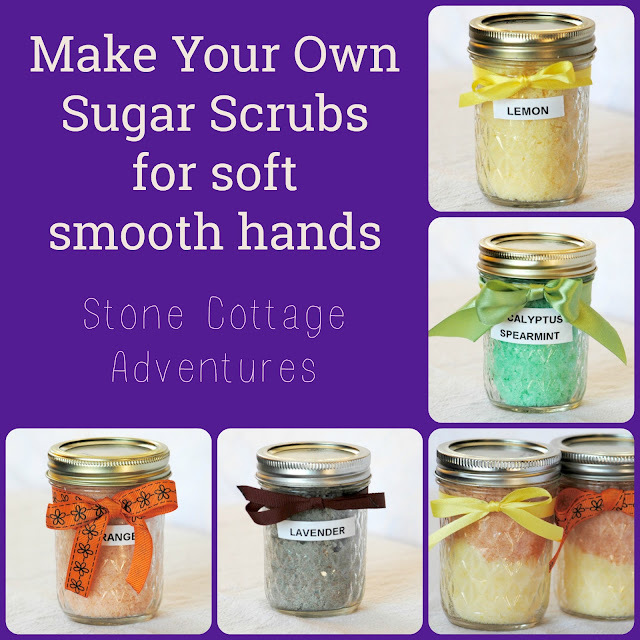 Sugar scrubs keep my hands much softer and are a perfect gift for my Gal Pals! Here's what worked for me. For one cup of sugar, I used 10 drops of essential oil with between 1/3 and 1/2 cup oil, stirring until combined. Place in jars with air tight lids. For use, scoop out a nice heaping tablespoon. Massage all over hands for about a minute. Rinse with warm, soapy water. Since I also make lye soap and lotion, there are multiple options for oil in my stash. *I prefer using a combination of equal parts almond oil, olive oil and coconut oil. * Any nice quality, plant based oil will be OK for this recipe. 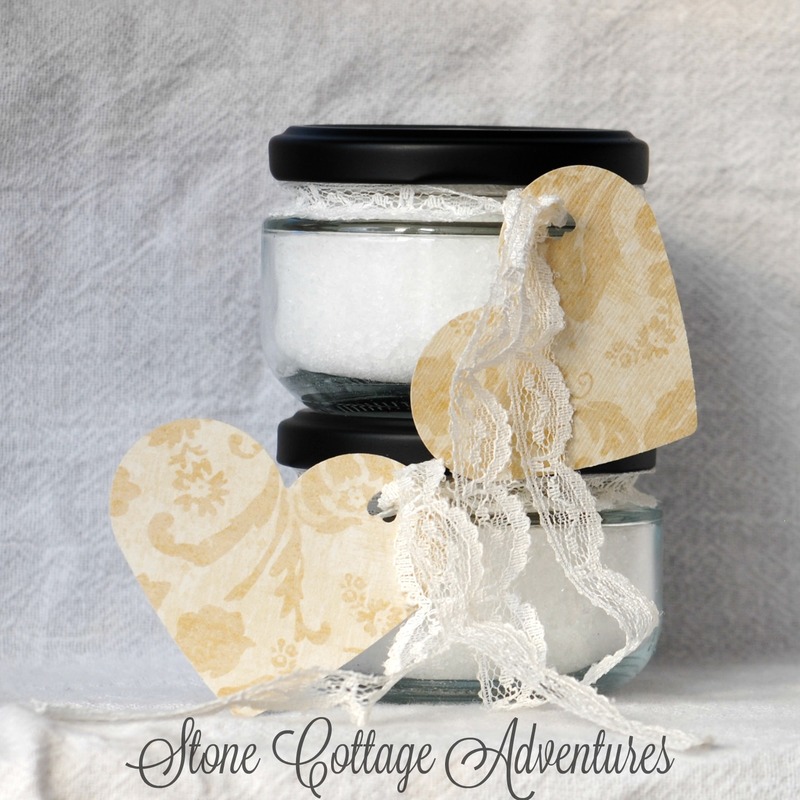 Fancy up your jars with labels and a little ribbon or lace! My favorite sugar scrubs were a mix of complimenting fragrances. These jars are half lemon and half orange! 'Very refreshing on cold, dark days! What are your tips for soft hands in harsh winter weather? How do you celebrate Valentine's Day? 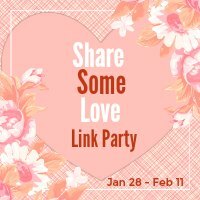 Beginning Monday, January 28th, I will be co-hosting a Valentine's Day themed link party. Whether you celebrate romance or friendship (or both) 😉 please join us! These will make wonderful valentine's gifts and such pretty colors! My friend made us this last year for Christmas, and it was fabulous!! I need to do it now! I just love sugar scrubs! We make them every now and then and they're great for cleaning up hands after painting too. Pinned. I have a salt scrub but when I get cracks on my hands it doesn't feel too good. This looks like a great alternative! These would be perfect gifts for Gal-entine's Day! I love the assortment of colors. Pinning. I love this gift idea! I need to make some for myself, too! This is one of those items that I would love to make sometime. It's been on my list for quite some time and sugar scrubs make such a perfect and easy gift to make! Pinning. I think this is perfect for the weather and for galentines day! Thanks for linking up with us at #OMHGWW and hope to see you next week. I love making sugar scrubs, I make them for my daughter since her allergies mean we have to be careful of what is in her personal products. I love the simple ribbon on the jar, so cute for gift giving! Pinning!